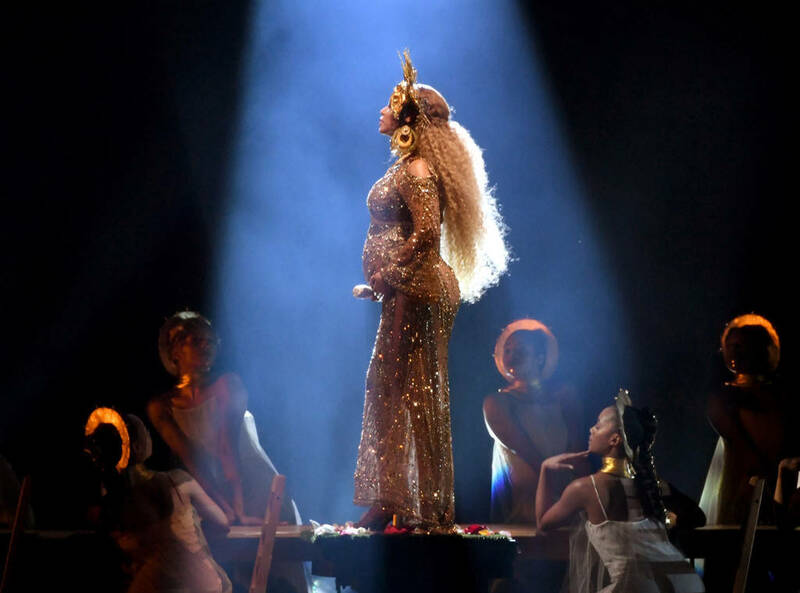 This year's GRAMMY Awards Album Of the Year Nominees (in case you missed them) were: Adele - 25, Beyonce - Lemonade, Justin Bieber - Purpose, Drake - Views, and Sturgill Simpson - A Sailor's Guide To Earth. Today's most heated debate post-The 59th Annual GRAMMY Awards ceremony is "Was Adele a deserved winner of Album Of The Year?" I'll tell you this for nothing, I quite simply could not care less. Hell, I haven't even listened to the thing! But there's one aspect of this argument that has me extremely vexed and it goes something along the lines of "Beyonce doesn't write any of her songs. Beyonce's songs have hundreds of co-writers. Adele is a better artist because she writes all of her songs." To anybody who has used this argument today, let me break it down for you. 1) First of all, let's dissect the true definition of the phrase 'Album Of The Year'. We'll start with the easy bit, "Of The Year" - Released between 1st October 2015 and 30th September 2016. (I don't believe there's much contention on this point, but you just never know, do you?) Secondly, "Album" - A collection of recordings issued as a single item on CD, record, or another medium. 2) This award IS NOT about the artist/the performer, or the songwriter(s). It is about the body of work in question. It really is that simple. Adele and Beyonce, as human entities singing the songs on these two albums, by and large mean absolutely nothing. 3) Both Beyonce and Adele have a songwriting credit on every one of the songs on the albums in question. Yes, that's correct, Beyonce wrote every single one of the tracks on Lemonade, whilst Adele wrote every single song on 25. 4) Neither of them were the sole writer of any of the tracks on their respective albums. Yep, you heard, Adele didn't write any of those songs on her own. 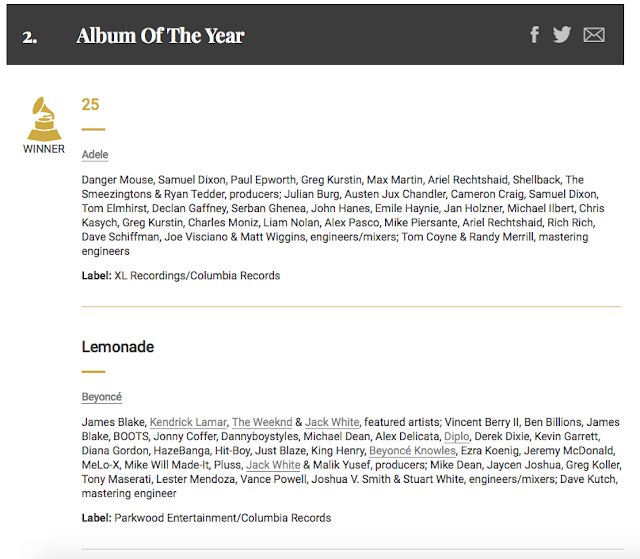 Between two and four songwriters are credited on each of the songs on 25, whilst between three and 15 songwriters are credited for each of the songs on Lemonade. 5) "HOLD IT! Between three and 15 songwriters?! Stop right there." Yes, I guess 15 songwriters does sound like quite a lot, doesn't it? However there are just some simple facts worth noting. 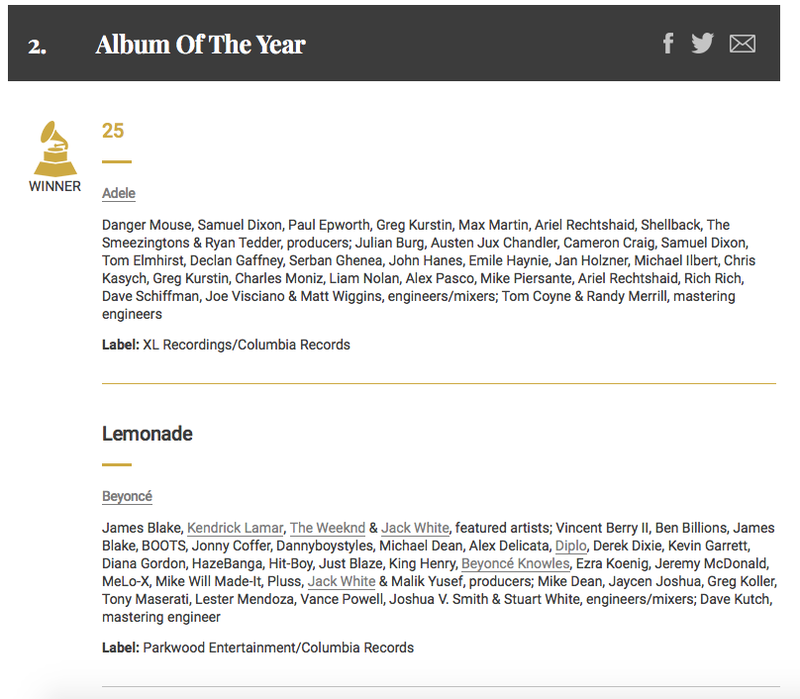 Lemonade has four separately credited featured artists (Jack White, The Weeknd, James Blake, and Kendrick Lamar) whilst obviously there are no other artists who feature vocally on 25. 6) "But that's four people across the entire album - where the hell do the rest of them fit in?" Well, that's an interesting point you raise. You see, producers on a song/album are given (what I am referring to for ease as) a "songwriters credit", whereas mixers and engineers on a song/album are not. This comes quite heavily into play when comparing two bodies of work that contrast in genre as much as 25 and Lemonade do. As you can see from the screenshot below, the lists of those involved in the creation of both albums are very similar in length. This is because there are far more mixers/engineers who worked on 25 (for all of the orchestral bits and what not) than there were on Lemonade. But at the same time, there are far more production elements on Lemonade (think of all the electronic and sampling aspects) than there are on 25, therefore leading to more producers. 7) If you truly believe that Album Of The Year is about the songwriter then Sturgill Simpson runs away with the award without a shadow of a doubt. Simpson is the sole songwriter throughout his entire album, A Sailor's Guide To Earth, with the exception of his cover of Nirvana's 'In Bloom'. 8) Unfortunately for Sturgill, it's not. 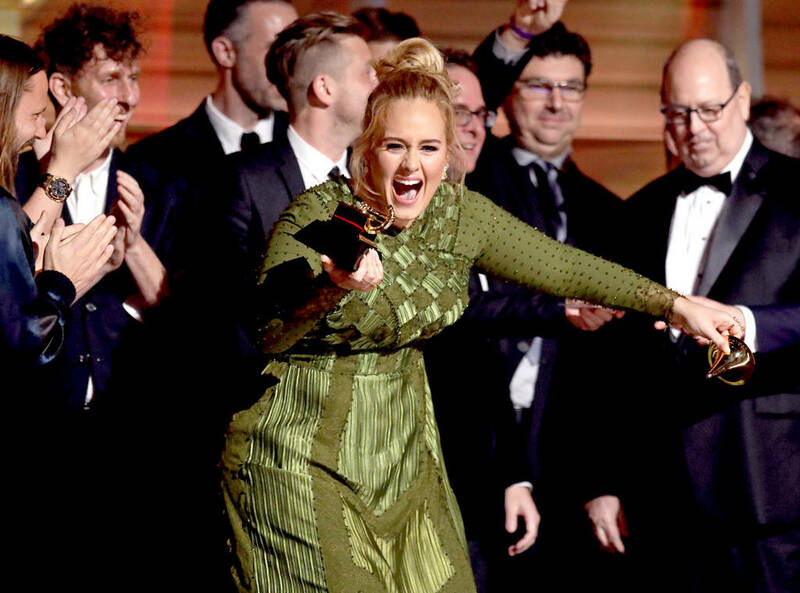 Adele has been crowned the winner, she tore that crown up like she was Cady Heron at Prom and she's shared the award with Beyonce. We, as nobodies in the presence of greats, should respect that decision and quit arguing amongst ourselves about it.